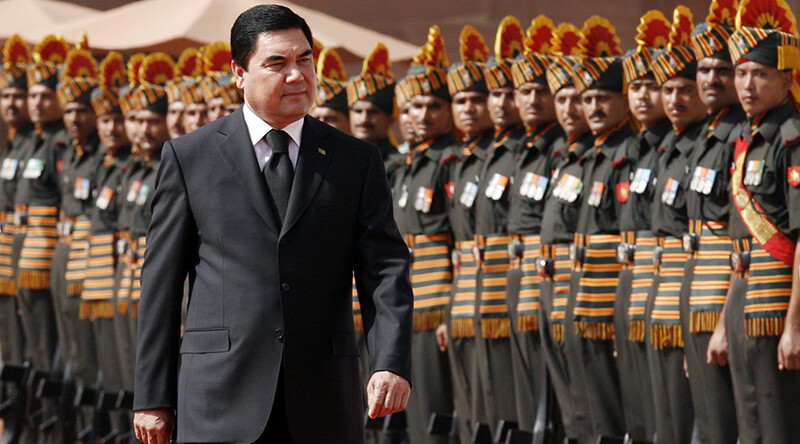 Turkmenistan’s president showed off his military prowess in an inspection of the nation’s troops by channelling his inner Hollywood action hero. Gurbanguly Berdimuhamedov, who is also supreme commander of the Armed Forces, turned out in full military attire on a recent visit to a military base located to the south of the capital, Ashgabat. Undated footage of the outing shows an SUV speeding through the desert, before the diminutive Berdimuhamedov steps from the vehicle wearing a khaki military uniform, matching gloves and a flak jacket. According to Turkmenistan’s state news agency, the president took the opportunity to display his shooting expertise with an automatic rifle in front of security personnel. “Having sampled the weapons… the head of state demonstrated his accuracy hitting the target, which indicated the high level of his military training,” a Turkmen report of the inspection, translated into English, said. Alternative news channel The Chronicle of Turkmenistan released footage of the military inspection on YouTube on Tuesday, but appears to have added footage of Arnold Schwarzenegger’s 1985 film ‘Commando’ into the mix. Jam-packed with outrageous action scenes, the Hollywood film tells the story of a retired Black Ops commando waging a war against a South American gang. Turkmenistan’s president reportedly showed off his skills at “handling cold steel” by firing a handgun at the targets, which bore an image of a man in a trilby hat holding a pistol. Berdimuhamedov was also filmed throwing daggers into the face and chest of the human-shaped targets, with the footage suggesting he also oversaw a helicopter-led operation in the desert. The masterfully edited production is on par with Berdimuhamedov’s previous appearances on state TV, including using DJ decks, serenading energy plant workers, and winning a horse race (which was marred by an embarrassing tumble for the president).